Summary: Two non-technical canyons in the vicinity of Tortilla Flat in the Superstition Wilderness. Some climbing ability is required to negotiate these canyons. Directions: From Phoenix take US 60 east to Exit 196 for Idaho Road and Highway 88. Drive northeast on State Highway 88 as it winds its way past the Superstition front range and down to Canyon Lake. 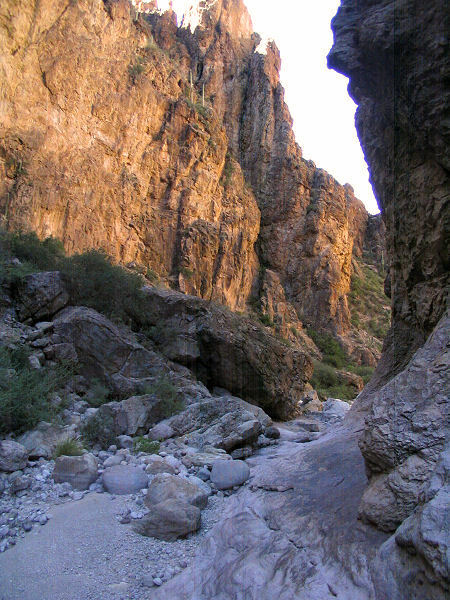 For Peter's Canyon, park at the popular tourist attraction of Tortilla Flat, for Apache Trail Canyon continue 3.3 miles past Tortilla Flat and park at a small pull off on the left next to a cinder block wall that encloses an electrical transfer box. Hike Description: Apache Trail Canyon: From the parking next to the cinder block wall, walk across the road and roughly follow the direction of the power lines that extend southeast from the metal tower (not the ones that extend from the wooden pole). Look for a route that bypasses the brush and cliffs down into the canyon bottom. 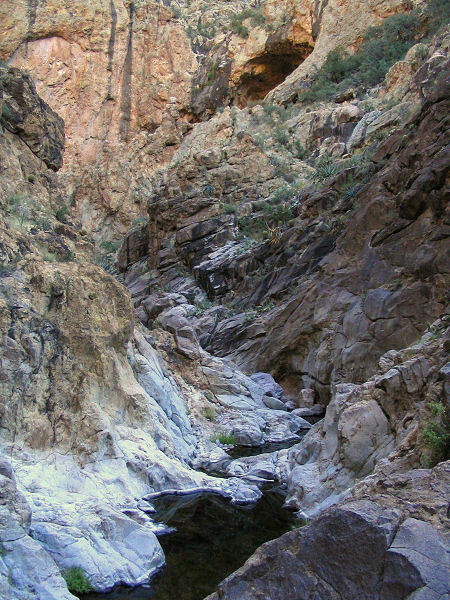 Once down, walk down canyon and soon you'll arrive at a drop off into a set of narrows with small pools. Bypass the drop off by walking along a bench on the right (when facing down canyon). Just below where another drainage enters the canyon from the opposite side, look for a route that will allow you to climb down (note: the down climb is steep with some exposure, if you are not comfortable with the down climb, this is a good spot to turn around). 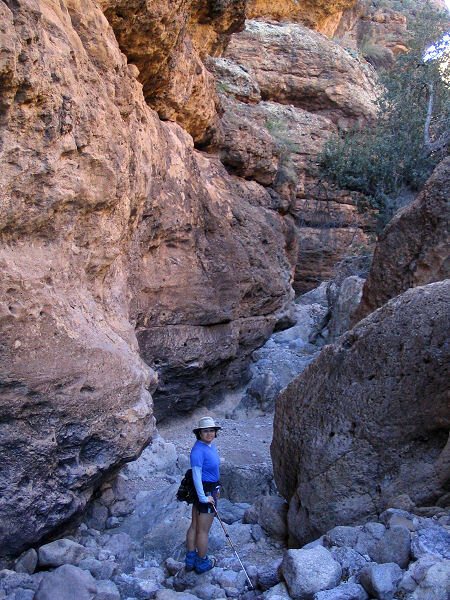 Once in the canyon bottom, if you don't mind getting your feet wet, you can explore up stream into the narrows. When ready, continue down canyon. The drainage is a little brushy in places and very rocky. You will have to do some climbing to get past some large boulders that have fallen into the canyon. 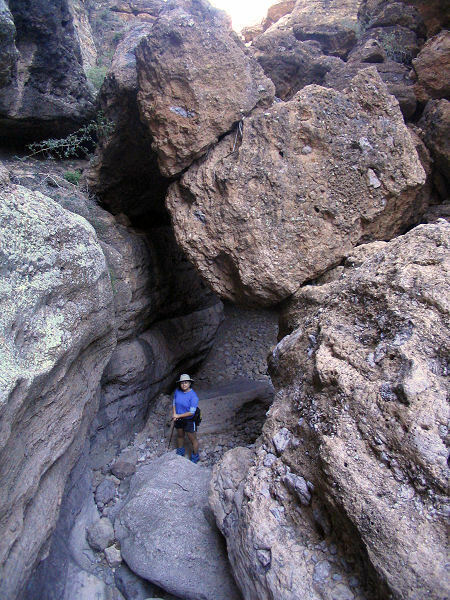 In several spots the boulders are exceptionally large forming bridges and tunnels (one of which is particularly long and dark). After some hiking, the canyon suddenly widens out. There are two options for escape - you could continue down canyon until either the cliff band on the right fades to a slope that you can climb, or follow the canyon all the way down to where it hits Highway 88. I opted for the former and climbed out after walking about 15 minutes past where the canyon became wide. The climb wasn't too bad, but be aware that there is another minor drainage between this canyon and the road, that you will have to bypass or climb into and out of. Once at the road, simply follow it back to your car. 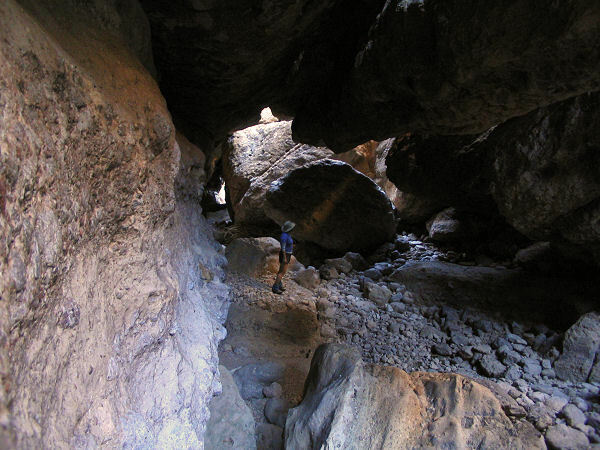 Peter's Canyon: From Tortilla flat, begin your hike where Tortilla Creek crosses Highway 88. Just upstream of the road you'll soon pass a small dam, then it's just a matter of hopping rocks up stream. After about 15 minutes, stay right at the 1'st confluence where Mesquite Creek enters from the left. Stay right again about 30 minutes later, leaving Tortilla Creek and entering Peter's Canyon. 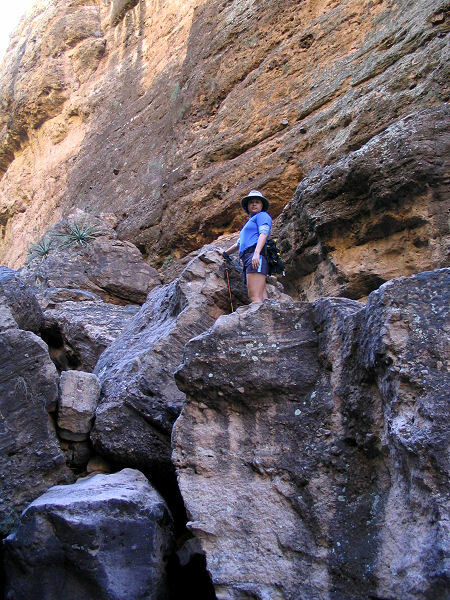 The creek bed becomes considerably steeper at this point and is filled with large boulders. You'll have to do a little route finding and climbing in order to pick out a path up, around and between the large rocks. Above the boulder field, the canyon levels out and slick rock appears underfoot. The slick rock turns back to river rock as you near the narrow section of the canyon. The narrows are fairly scenic with some interesting rock formations and cave-like alcoves (the latter of which are all unfortunately filled with trash). There may be a few pools in the area that will require you to climb around on one side or the other if you are determined to keep your feet dry. Just past a point where a huge alcove dominates the right hand wall (facing up canyon), the canyon widens and becomes less interesting. Turn around whenever you feel like it and return the way you came. The author and his wife completed Apache Trail Canyon at a medium pace in 4 hours. The author then hiked solo up through the Peter's Canyon narrows and back at a fast pace in 3.5 hours. Maps: Click here for a map. Typical view in the canyon. Boulder bridge. Boulder tunnel. Apache Trail Canyon. Peter's Canyon Peter's Canyon narrows.